For 2018, MEDICA and COMPAMED trade fairs have been a huge success with nearly 120000 visitors from all over the world to see the latest developments in the digitization of the healthcare industry. 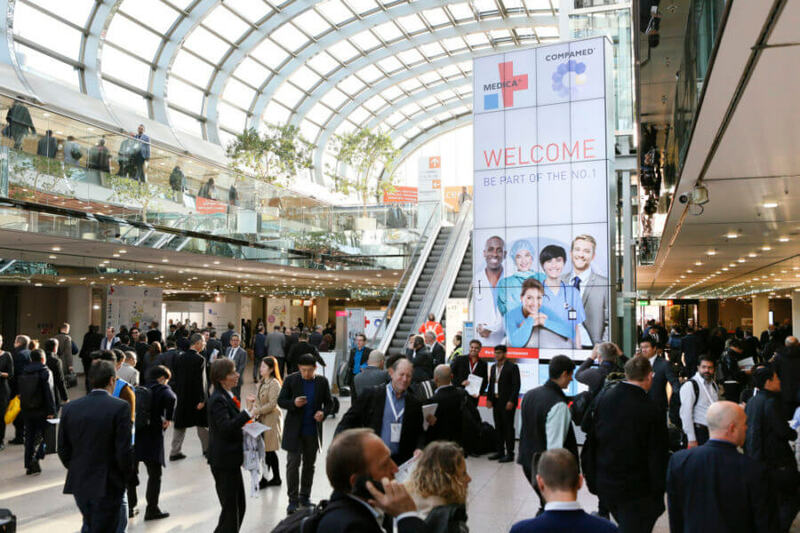 Do not be surprised that once more, the top working forces in the international healthcare industry were successful in drawing on their full potential at MEDICA, which is the world’s biggest medical trade fair and COMPAMED, which is the top international supplier trade fair in Düsseldorf. Nearly 120,000 trade visitors including about two-thirds of the international visitors from 155 nations attended the event from 12 to 15 November 2018 something that had never happened before. There were 5,273 exhibitors from 66 nations at MEDICA and 783 exhibitors from 40 nations at COMPAMED. More and more start-ups from around the world are also seeing the fair as an opportunity to represent their innovative ideas to some of the world’s biggest decision-makers and marketers. MEDICA is one of the top medical trade fairs in the medical industry, and The COMPAMED is the prominent trade fair for the medical supply industry and for medical product development. This is why the specialists, market leaders, decision-makers, managers, physicians, and many other people working in different areas of the healthcare industry from all over the world attend this 4-day event every year. Medica and Compamed present the forward-looking technology which is being developed with the implementation of the cutting-edge designs while adding in fresh, functional abilities. According to Wolfram Diener, who has been the Managing Director of Messe Dusseldorf since October 2018, there is no other event in the world that has such a smooth chain of processes with lectures by well-known experts and innovations for the product development, making and marketing of new medical devices, products, and medical instruments, and highly advanced technological solutions for healthcare industry. In addition, Diener was able to draw the comparison because previously, he had worked on a top position for many years with another trade fair organizer for the Asian business. He got some great insights into the markets of different countries, their structures, and innovation direction. He also said that, at MEDICA, the people coming to attend the fair to get to see the future of healthcare industry and what is primarily possible pertaining to modern outpatient and inpatient medical care and what the newly developed procedures and healthcare models can offer. The impulses regarding the future of the healthcare industry are actually becoming more important in German markets as the medical suppliers in the country are actually facing the pressure of ever-increasing prices. Fortunately, innovation and new technologies are also moving toward increasing orientation in the country. Perhaps the best part of MEDICA is that it offers the innovations and technological solutions in the health care that are not only great business prospect, but they also benefit both doctors and patients in a great way. According to Horst Giesen, the Global Portfolio Director of Health & Medical Technologies at Messe Düsseldorf, it will not only be very advantageous for patients to have more resourceful use of the medical staff, but they can also gain a lot from the easier access to specialized know-how. For example, experts sitting abroad or at the neighbouring medical universities or clinics can be a part of complicated surgeries virtually. Along with the MEDICA, COMPAMED did convince the organizers for exactly the 27th time that why it is a worldwide leading event for those involved in healthcare technology supplier markets all over the world. The event gave the medical research companies and institutes to present their technologically advanced medical solutions to the visitors for the advancement and invention in the medical technology industry. New pathways in gene therapy | Curing diseases with genetic mutationsHow to raise funding for your digital health startup in India? me hagan meditar. Gracias por redactar este gran contenido.